If you're Indian you know this already and if you aren't you may not care, but in this essay, I want to pay some attention to a new innovation in the annals of violence: the Whatsapp driven lynchings of muslims accused of being rustlers of cows, though like every other innovation, it's spread to lynchings of men and women accused of stealing children. We are having our Salem Witch Trial via social media moment. My take is that they are a cheap and targeted way of sowing terror in the Muslim community. In fact, they are better at achieving that goal than the previous innovation in the annals of violence, i.e., riots. In comparison with riots, lynchings are less expected, more sharable and cause more helplessness in the minds of the victims. In other words, truly shameful and disgusting and evil but with a malevolent logic that suits the times we are in. 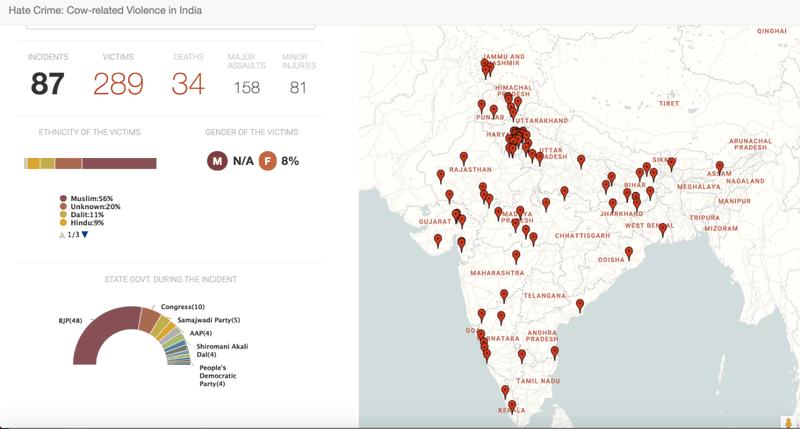 Indiaspend recently released a visualization of all the cow related violence in India since 2010. Note how they are all concentrated around Delhi and almost all of them are in North India. We'll come back to that later. Yes, it's the 21st century and it's an abomination that lynchings are even happening. Of course they have to end and of course everything about them is about terrorizing Muslims. Especially when you read that the police are doing absolutely nothing to save the victims. 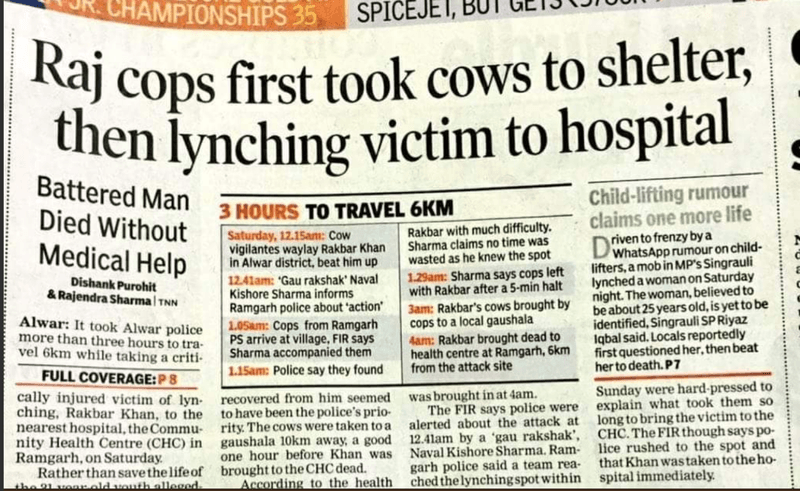 Nevertheless, there's a gruesome logic to lynchings; one might argue that they are better than riots, for the latter kill people wholesale while the former are retail murders. They might also be more effective in achieving the political goals behind them. For that reason, they are the perfect terrorist acts. In fact, they might be the quintessential acts of terror in the age of social media. It must strike fear into the enemy. It should cost you little. It should make maximal use of media. What does this tell an Indian muslim? It says that your life is utterly unimportant (as a vegan, I am not inclined to say “your life is less important than an animal's”) that you can be assaulted out of the blue and when help arrives in the form of the police, they might do nothing or side with the oppressor. At least you can prepare for riots. But if you can be picked out of the blue, assaulted and your beating is broadcast on a thousand Whatsapp channels, you are being told that all resistance is futile and that you have no power whatsoever. Now to speculate on their political objective, we have known for a while that the emasculation of Indian muslims serves the current dispensation. The message that's being broadcast is that you can vote as an individual but you can't vote as a muslim, i.e., your community's interests don't matter and we will actively discourage you from voting as a community. How might one accomplish the emasculation of an entire community? By facilitating a form of learned helplessness and what better way to accomplish that than to encourage small but targeted acts of extreme violence so that you lose all will to articulate and defend your political goals. If riots constitute an industrial form of violence, lynchings are the violence of the information age. Quite similar to drone attacks, which too track their victims from far away and the bomb arrives out of the skies. It's the marriage of video-games, predictive analytics, social media spectacle and communal hatred. We'll see more of them for sure.